CDAVID HALL-COTTRILL provided the longest continuous walking thread, ranging from a City Hall restroom to 12th and Callowhill, over to 8th and Vine down to Lombard St., then over to 15th and back up through City Hall, continuing north through LOVE park past Spring Garden. On his way across 15th street he encounters this protest RV (with protesters locked inside) which is blocking 3 lanes of City Hall traffic as police discuss what to do and pedestrians act confused ...all while the tower clock slowly clongs noon. Additionally, cdavid filmed half of his walk down Broad Street, the proclamation ceremony, and his car trip into and out of town. 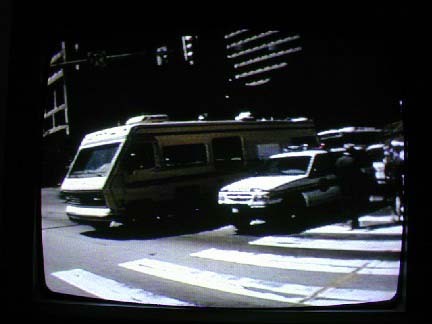 Although Capsule Day, it was stressed, was about the quantity of information gathered rather than the quality, cdavid also managed to put his personal stamp on his footage, focusing on garbage trucks and trash cans, looking for discarded treasure and at one point picking up a steel grille off the sidewalk. He also took viewers into the innards of the old Please Take Materials Exchange at 12th and Callowhill, which has since relocated. As with other pages, what follows is the most rudimentary form that the page will take, currently in the narrative-text stage, but representing the overall structure and linking networks that will underlie the eventual VR experience. A link glossary explains the different ways portions of one project may be linked to another. Over time, stlil shots and video clips will fill in for the narrative descriptions, and link possibilities will be presented visually and iconically within the imagery. To the right is an image map of cdavid's route, a low-tech version of the mapping that will be done to allow future users to step into a Capsuler's shoes at whatever point and see the world of 1999 from that angle. Key points (e.g. City Hall) are linked to descriptions below. Try it out. Turns right on Broad St., continues South past Inquirer Building . Turns right on Arch and continues East to 12th St.
Continues south on 8th past Police Headquarters etc. cuts down Pine to 15th As cdavid crosses Broad he aims his camera north to City Hall, a shot which appears in PART THREE of the CAPSULE DAY VIDEO SAMPLER. Exits courtyard; City Hall clock starts tolling noon, slowly. crosses Spring Garden at 16th and proceeds up 16th to Wallace. turns right on Wallace and gets to his car.